Smythe's has weathered recession, online competition, and a perception of accordions as coarse-sounding period props. Now it's the only public accordion center in the Bay Area. Kimric Smythe first opened his accordion shop in 1997. Accordions have been ceding cultural cachet since 1957. At least, that's the "generally accepted date," according to Smythe's Accordion Center proprietor Kimric Smythe, that the polyglot squeezebox business started to contract. "Then they became insanely uncool." But accordions' existential crisis is less about waning relevance, Smythe argued, and more about the steep decline in people who can teach and maintain the instruments. Smythe's Accordion Center is a small Oakland storefront on Broadway with a buzzer-entrance and an animatronic clown in the window, its shelves stuffed with largely refurbished piano- and chromatic-style accordions amid artifacts of the instrument's past popularity in the Bay Area. Smythe, a congenital tinkerer, opened the shop in 1997 on the earlier site of Meni-Ketti House of Music, which accordionist Orlando Meni-Ketti founded in the 1930s. Smythe's has weathered recession, online competition, and a perception of accordions as coarse-sounding period props. Now it's the only public accordion center in the Bay Area. Smythe's main competitor in the East Bay, Boaz Accordions, went out of business in the mid-2000s. San Francisco's Accordion Apocalypse moved to Petaluma and is now only open by appointment. 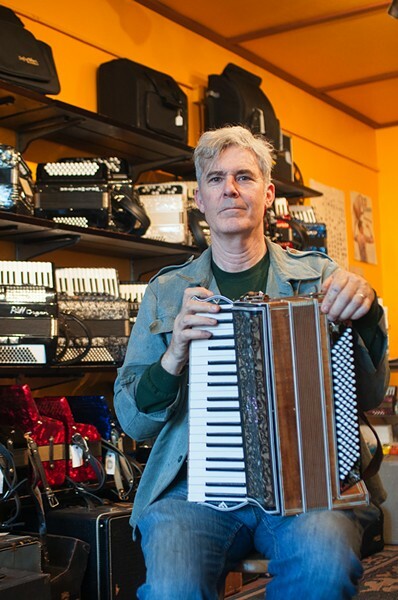 East Oakland shop Fiore's Music, founded by accordionist Jack Fiore, shuttered in 2017, a few years after downtown mainstay Best Music Co. Lifer repairman Vincent Cirelli, a local accordion fixture since the Great Depression, died at the age of 91 in 2012. Hence, the local accordion trade has basically bottlenecked at Smythe's. Accordions' stubborn perseverance — their uncanny ability to still sustain a specialty store in the age of Guitar Center — owes a lot to their multicultural applications, as they maintain roles in both traditional and popular music from Eastern Europe to South America. Though San Francisco groups such as Polkacide and Those Darn Accordions have used accordions in subcultural or punk-adjacent contexts, the instrument is much more so a fixture of styles including zydeco, klezmer, polka, tango, and folk music rooted in Ireland; adherents of all shop at Smythe's. "There's also the pirate or maritime music scene," Smythe said. "Then, without question, there's the Tex-Mex or Tejano scene, which weirdly overlaps with the folk accordion scene — they all play 'Jambalaya.'" Smythe, 56, has been a called a "steampunk legend"; he hails from the sort of San Francisco counterculture milieu that felt disenchanted with Burning Man by 2000 ("I don't like techno," he said). For decades, he's worked with robotics art-troupe Survival Research Laboratories and other groups of engineer-minded autodidacts. He got into accordions in the early-1990s through the Cacophony Society, an amorphous collective known for culture-jamming pranks, gravitating toward repair more so than playing. "There are no manuals, no blueprints, and there were hundreds of manufacturers, so no two instruments are alike," Smythe said of working on accordions. "You can really see the hand of the person who made each one — it's a lot like doing archeology." Smythe learned about Meni-Ketti, by then a rundown Grand Avenue storefront with a sideline in furniture, shortly before its namesake died. "It was full of broken instruments, and I got the thought to try to fix them," he said. He rented workspace in a backroom and, soon, his friends launched a gallery and experimental music venue in the front, 21 Grand. Smythe's and 21 Grand moved to two different locations together in the 2000s before the accordion shop established its current, larger storefront on Broadway in 2011. Since, Smythe's has become a resource as well as a repository for regional accordion lore. Smythe pulled from the shelves one unique instrument after another: an ergonomic piano accordion, made by a San Francisco company that folded during the Great Depression, and another with pearl inlays created by Swiss craftsman Paul Greub on Capp Street. Smythe reverently invoked names such as Cirelli, noting that, before World War II, the repairman worked at Colombo & Sons accordion factory on Telegraph Avenue.